Simply the best address in Youghal. Opposite the promenade and lighthouse where everyone else strolls to take in the views and take photos. You can enjoy the view throughout your stay. A short stroll into town or to the beach, you don't need to use your car. Our previous broadband was good, but we have upgraded as soon as we could. Our broadband now runs at around 30MB/s which is really quick, particularly here in Ireland. And its still free, of course, for our Guests. Our Guests have always asked about the area and we've tried to offer advice before... but now we've taken that to whole new level. Martin has spent ages selecting and compiling an exhaustive list of all the places we recommend that you see, things to do, places to visit, places to eat, beaches and activities. We've also added some selections that have been highly praised by previous Clifton Guests too. It's a personal selection for our Guests and so we call it the Clifton Club Directory, you can find it on our website. Our Clifton Club Directory has dozens entries and will continue to grow, but there are too many things to do for one holiday, and our Guests are different ages and want different things. And so we have created a Personalised Itinerary Service for our Guests (free of course). When you book with us we'll ask your about your Group, their ages and interests, etc. From your replies Martin will personally select a suggest Itinerary of places to see, things to do, places to eat. He'll even help out if there is something in particular you want to organise. Your itinerary will be sent to you before you arrive so that you can plan your trip. Some Guests like to bring their own bikes, but the we had nowhere to store them. We are creating a bike storage area for each house, so that your bike can be stored secure and dry and out of the way. PS: We love cycling around here, there are lots of easy routes and plenty to challenge the more adventurous. You can hire bikes locally too, all details are in the Clifton Club Directory. 3 Clifton is one of just 6 Victorian townhouses that were built to the highest standards over 130 years ago. After years of renovation and restoration we created this fabulous luxury townhouse. 3 Clifton is a listed property in a heritage area. Read the reviews and most of the guests rave about the views from the front windows, particularly from the window seat on the main lounge. They are right, the views are spectacular - taking in the Atlantic ocean to the South, the hills and mountains of county Waterford to the East, the river Blackwater to the North and the beautiful river estuary right in front. The river meets the sea directly in front of the house, and many guests happily while away the hours watching the ebb and flow of the tides, the fishing and leisure boats drifting by and the wildlife. Maybe its the latter they they are particularly watching for, because on bright sunny days, when the sea is calm we have had multiple pods of dolphins cavorting right in front of us - its certainly a sight to see. Of course they are not there to give us a show, and they don't come on demand they are not tamed in any way and are hunting the mackerel shoals that are plentiful in summer months and which they have chased into the estuary. 3 Clifton has been renovated to the highest standards to offer you luxury and comfort whilst retaining some of its original character. There are 2 spacious double bedrooms, 1 twin and a bunk-bedroom (perfect for kids). Bedrooms are fitted with solid oak furniture and other luxury touches. Double beds are queen sized. Beautiful linen is provided to wrap you in luxury while you go to sleep to the sound of the lapping waves beneath you. The huge lounge occupies the middle floor with double aspect windows, sofas beside the open fireplace and window seats to soak up the views and atmosphere. There is a large flat panel high definition TV, DVD and Video players, plus multichannel Sky TV available. You'll also find free wireless broadband internet access. On the ground floor the modern styled kitchen diner provides every essental luxury and the space to dine in style. The kitchen is equipped with a double oven and ceramic hob (all electric), dishwasher, fridge, wine cooler, toaster, kettle and Nespresso coffee machine (well supply some coffee - but you might want to bring some more with you). In the diner section there is an extendable table that will seat at least 8, plus an easy chair, window seats and flat panel TV - its another relaxing seating area (you are on holiday after all!). At the very top of the house is a full size bathroom, there is a toilet on the mid level and a separate power-shower room with toilet too. 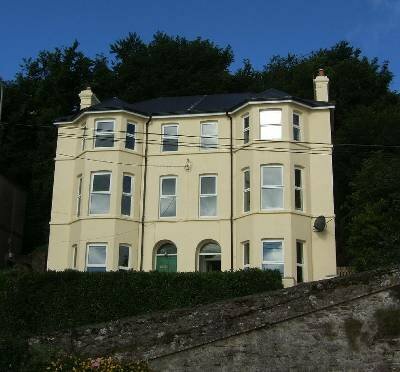 On the ground floor the utility room has both washing machines and tumble dryer - although you can get service washes in Youghal town centre if you cant be bothered. Outside there a huge patio, with seating for 8 . What a fabulous place for breakfast or for a barbeque. The house is approached by a easy paved slope and is elevated above the road affording fabulous views over the river and out to sea. 3 Clifton is a 3 storey house, and there are 42 low-rise stairs to the top, arranged in 6 short flights of stairs. The stairs should present no issues for an able person of any age. Our children had no trouble with the stairs even when they were toddlers and were helping us prepare the house for guests: a stair-gate is included so that you can keep the stairs off limits if you wish. Older guests should have no problems, and of course they can always select the bedroom on the middle floor so that they dont need to climb to the top at all. However, we do not recommend 3 Clifton for the infirm. In the days when the six Clifton houses were built Youghal was smaller town and these houses created the space, views and ambiance unavailable in the close confines of the town - they still do. Any yet the town is just a stroll away, no need to drive or for taxis, its just 1 minute stroll to the nearest pub and restaurant. You can stroll to all of Youghals main town centre attractions within 5/10 minutes. The nearest beach is a 1 minute walk away too, you are looking down upon it from the house. The main Strand beach is less just 1/2 mile stroll along the promenade. There are secluded coves even closer, great rock pools to explore and the diving rocks. To get to these you cross the road, walk 100 yards to the right and take the steps down to them. Shopping - well you can stock up in the large supermarkets in town including Tesco and SuperValu. But there is a really well stocked minimarket just a 1 minute walk away, beside the nearest pub, and the nearest beach, and a large grassy park for the kids to run around ( I guess you get the message - you dont need your car). Just 10 minutes walk (along the promenade) or 1 minutes drive to the brand new public swimming pool, gum, sauna, water slide complex. Its open 7 days a week, 3 pools to suit babies, new swimmers and competent swimmers. The gym is fantastic, with over 50 pieces of equipment, music and sky TV to divert you. Its open to all up to 10pm on many nights - pay as you go.